Childhood memories can be elusive — mere wisps of smoke and faint dreams of what might have been. I have only the vaguest recollection of what my life was like prior to the summer of 1977. I turned nine years old that summer. I know the basic details of my life at that point in time. I know that my parents were divorced, but I can’t remember any particulars as to how, when or why it happened. I know that my best friend was Andy Thomas. I know that I lived with my mom, but spent every Wednesday and alternating weekends with my father. But even these memories are vague and uncertain. They are simply old Polaroids — blurry images set in a world of washed out colors. But I remember one particular day in the summer of 1977. I remember it with all the clarity that memory can offer. It is in high definition — the edges of those memories are sharp, and the colors are crisp. And that day has, and always will be, the answer to the question — why do you write? I was nine years old, and my brother was seven. Word was starting to get around our neighborhood about a new movie. In 1977 there were no cell phones, emails or text messages. Word traveled on the back of a bicycle from one house in our neighborhood to the next. Of course, my brother and I had seen the commercial on TV — everyone had. But the twenty second clip of television offered little information as to exactly what wonders this movie might hold. There was also the advertisement in movie section of the local newspaper. But, again, the advertisement offered even less information than the television commercials — just tantalizing images. Some of the kids in our neighborhood had seen the movie — or at least claimed to have done so. I remember that I couldn’t even get the name of the movie right — I kept referring to it as War Stars for some reason. My brother and I begged my father to take us to see it. The first opportunity arose when we were visiting my cousins in Norfolk, Virginia. We went to the local theater only to discover a line that seemed to go on forever. My father — having no personal interest in seeing this movie — declined the opportunity to stand in line for several hours. The next opportunity came when we returned home to Augusta, Georgia. We made our way across town to the Peach Orchard Movie Theater — the first theater in Augusta to offer two screens. Unfortunately, we encountered the same predicament as we had in Virginia — a line that wrapped around the building. My father, once again, wisely declined the opportunity to stand in line for several hours — particularly in the hot Georgia sun. The following Saturday offered yet another opportunity. My brother and I implored my father to get us to the theater well ahead of the appointed movie time. Assuming (correctly) that we would persist until we saw this movie, he made sure that we had positions near the front of the line while he sat in the air conditioned comfort of his car. It was a smart move. The line — once again — grew to an unimaginable length. We eventually made our way into the theater — bypassing the distractions of popcorn and cokes — and secured the best seats possible. I remember sitting in that theater astounded at what I saw on the screen. I remember the dread I felt as Darth Vader lined up Luke’s x-wing fighter on his targeting screen. And I remember being absolutely blown away as the Millennium Falcon appeared out of nowhere to save the day. (As I wrote that sentence, chills — actual chills — went up my spine). As we drove home in my father’s Ford Thunderbird, I sat in the middle of the backseat looking across the front of his car and through the rectangular hood ornament. I imagined that it was a targeting screen on the Falcon, and I was taking down TIE Fighters one after another. The oncoming traffic didn't stand a chance. The idea that the world of Star Wars had its genesis in the head of one person is incredible. George Lucas may have borrowed concepts and ideas from a wide variety of sources, but he created characters that I genuinely cared about. (I won’t give away any spoilers, but I cried at the end of the latest installment — The Last Jedi). Star Wars seemed real to me. Lucas crafted a story and a movie that enthralled a nine-year old boy sitting in a theater in Augusta, Georgia in 1977. That was an incredible feat. I didn’t walk out of that theater in 1977 thinking I wanted to be a writer. But the seed had been planted. It took years for that seed to germinate — I was in my early forties before I took a shot at writing fiction. My first middle-grade novel, Secrets of Shakespeare’s Grave, was released when I was forty-two years old. But I remember the excitement I felt as I developed the plot and characters. I remember writer’s block giving way to a rush of ideas. I remember the world in my book coming alive to me — and hoping that it would come alive to my readers. So the answer to the question is, perhaps, inherently self-serving. I write to capture just a bit — a smidgen — of the magic that Star Wars: A New Hope offered to me in such abundance. I want a little bit of that power for myself — and writing offered and continues to offer me that opportunity. 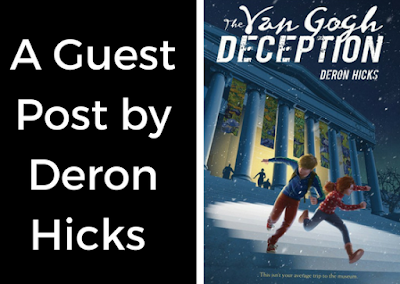 I want some young reader to gasp at the sudden and unexpected turn of events in my new book, The Van Gogh Deception. 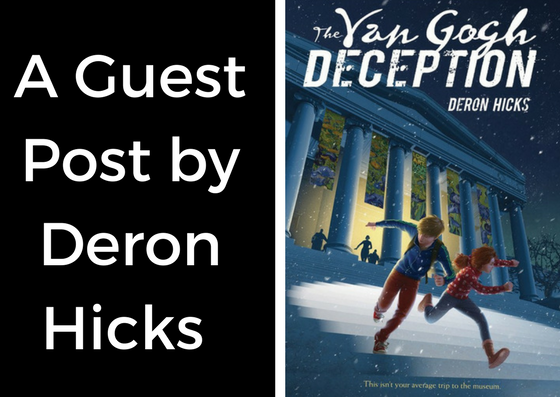 I want that young reader to care about my characters. I want that young reader to yearn for more. I want that young reader to feel exactly like the nine year old boy sitting in a theater in Augusta, Georgia in 1977. And that’s why I write. 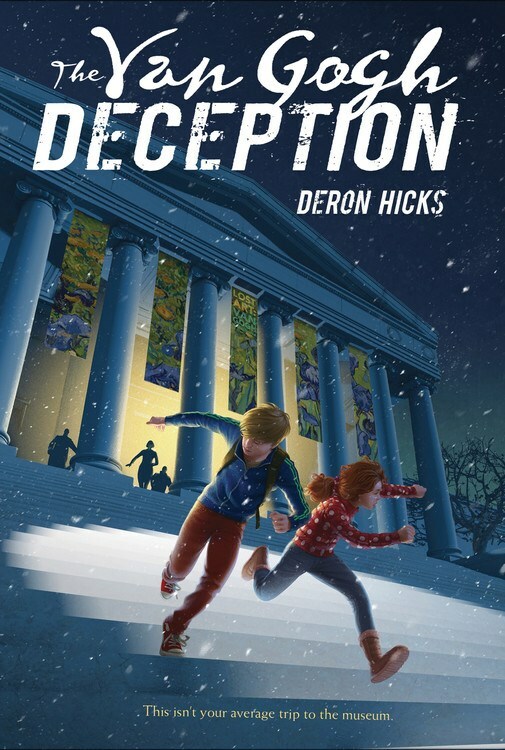 Borrow The Van Gogh Deception from your school or public library. Whenever possible, please support independent bookshops.